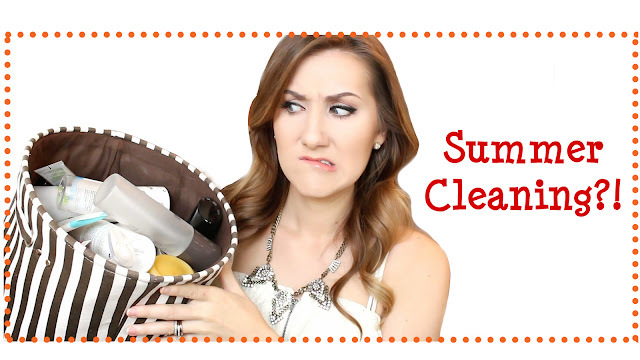 You know how most people have some sort of fabulous Spring Cleaning routine? Something about shaking out the mothballs and closed doors of winter and instead welcoming the wonder of spring? Well, I don't really get it. Possibly because spring is the season I respond to the least, or maybe because I'm always a little sad winter is over (seriously: candles, snow, gifts, candy?!). Either way, the whole "spring cleaning" thing never really does anything for me. This time of year, however, when the heat has settled nice and heavy into all the crevasses of life, when taking a deep breath feels more like inhaling scalding soup, when malls are packed with back to school shoppers and sales saturate every type of media imaginable, that's when I want to shed some of the excesses in my life. I took a moment this weekend to look at my shelves, feeling inundated with products. I examined my bedroom and nearly drowned in the mess. My walls left me uninspired and my kitchen? Less than functional. What's a girl to do? Well, to begin with, having a bathroom overrun with products makes me infinitely less likely to follow any decent skincare regimen. If I can't find something or don't know how long I've had it, it's hardly functional. And that's what practical skincare is about. So I began. I’m loath to discard things I'll use or things that I might need (hail, packrats! ), but sunscreen expires for a reason. A very practical reason. Its efficacy really does decrease over time and I had a range of sunscreens, from physical to chemical, drugstore variety to high-end, face, body, lips, shoulders, base coat, reapply, half-empty, nearly full, insanity! 90% or more were expired. Of my four moisturizers, two had been opened for more than a year. Not to mention that my bathroom is organized, my products are safe and fresh, and I stand a real chance of using my nighttime moisturizer at night since I can always reach it after washing my face. I now also have a real idea of what I actually use and what I need to replace. My bedroom took less time, washing all the bedding, spoiling myself with brand new (teal!) pillowcases, hanging some of the gorgeous artwork from my travels. I know that, going home tonight, out of the chaos of summer activities and back to school madness, I have an established retreat, a safe calm space to retire to every evening and launch from every day. It is clean and organized and when the holidays get started, it will still be clean and organized. My kitchen? Well, it's not perfect yet. But there's always next weekend!